In this solo dining adventure, Gary finally makes it to No. 7 Sub, only six months after he had planned to go the first time. As I’ve mentioned previously, I’ve essentially set up shop in the lobby of the Ace Hotel. Also having set up shop in the Ace Hotel is No. 7 Sub, a sandwich shop that Kate and I had actually intended on visiting during Foodie Call #8, only to be rebuffed by a “closed” sign shortly after 5 pm. This time around, I would not be rebuffed, opting instead to come here for lunch instead of a late afternoon meal. Getting there a little before 1 pm did indeed mean that the lunch rush would be in full swing so there’s the matter of whether a 15-20 minute wait for your order to be ready is worth it. The answer, as it is for a lot of places, really depends on what you order. 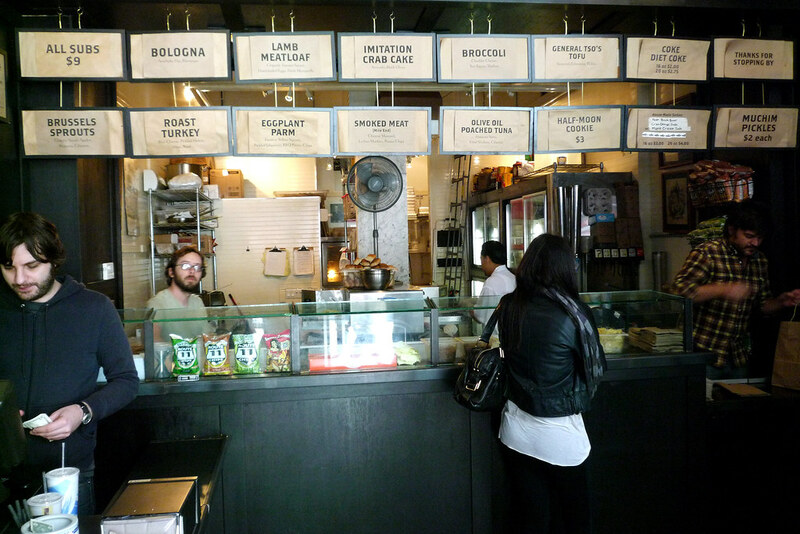 In the two visits I made over the course of writing this post, I had two sandwiches – one that was just absolutely wonderful and one that was kinda mediocre. 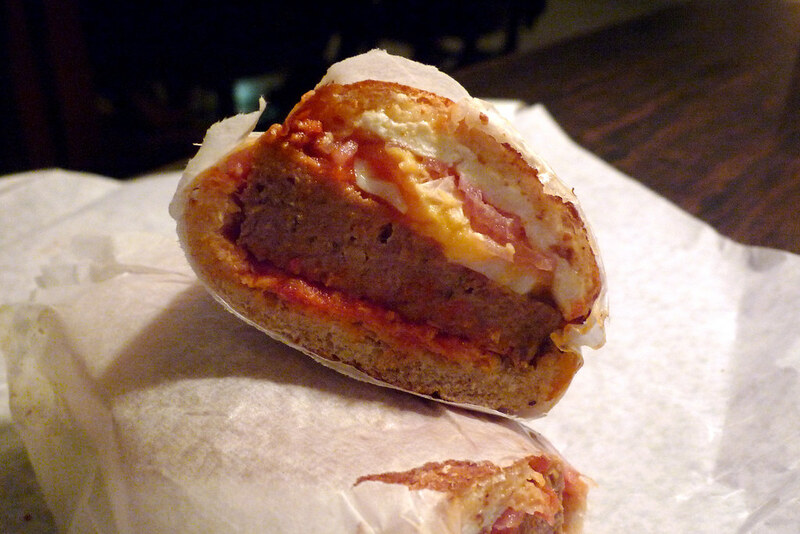 On my first visit, I had the Lamb Meatloaf sub which, in addition to the namesake lamb meatloaf, also includes chipotle tomato sauce, hard-boiled eggs and fresh mozzarella. As far as the meat goes, you get pretty good bang for your buck with plenty of the meatloaf in slabs nestled within some really good bread. Too bad they have a problem staying confined in the sub as I spent my entire time coaxing the meat back into the bread as I was eating it. I’m not sure what the hard-boiled eggs really added to the sandwich – they didn’t hurt it but weren’t really necessary in my opinion. The mozzarella was indeed fresh and tasty but, when separated from the lamb meatloaf by the hard-boiled eggs, was no help in keeping the meat adhered to the bread. On my second visit, I had the General Tso’s Tofu sub – deep-fried tofu with an edamame spread and plenty of seaweed. This, folks, is one hell of an awesome sandwich. Yes, as my friend Dave G. puts it, the deep frying of the tofu “takes away any illusion of healthiness” but I don’t think healthiness is what the folks had in mind when they came up with the sandwich. It’s certainly vegetarian-friendly but it’s clearly the case where vegetarianism and healthy don’t necessarily need to go hand in hand. 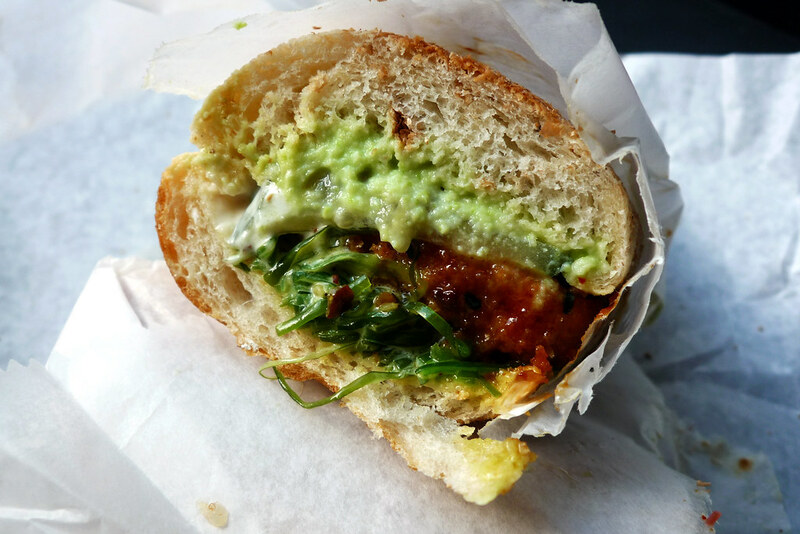 But, yeah, this sandwich just rocks. You’ve got the great crunchy texture from the deep-fried tofu, the cooling edamame cream, the always tasty seaweed and, of course, the spiciness one associates with anything General Tso’s. Actually, this sandwich is sneaky spicy – kinda like how Mets pitcher John Maine’s fastball is sneaky fast (for all my Mets fan friends). It’s definitely spicy right from the get-go but you don’t really get the full effect until you’ve eaten through a lot of the sandwich and, by then, you’re stuck with a lingering spiciness that will last for some time. The subsequent heartburn I got from the sub was well worth it though. All the subs at No. 7 Sub are $9 so the question of whether they’re worth the price is inevitable. Their subs are long and thin, which gives the visual impression that they’re small but they really are very densely packed. I think they’re about what you should expect when you pay $9 per sub at a Midtown sandwich shop. In the end, it really does come down to what your tastes are when it comes to sandwiches. Some of their subs include some pretty interesting fillings like potato chips or, in my case, hard-boiled eggs. Their creativity definitely scores points, no question there. More importantly, when you get past the artistry, there are some pretty solid sandwiches lurking underneath. No. 7 Sub. 1188 Broadway, New York, NY 10001. [Show/Hide Map] (212) 532-1680. Great summary! I really dug the Broccoli sub but found the Tuna one simply overwhelming and lacking in acidity (like the meatloaf one, however, lots of filling for your $9). Have you hit up breakfast? Their General Tso’s fried egg is awesome (and $3!) and the Roast Pork one is good too. @Chris Hope you like the tofu sub! One of these days, I’ll make it out there for breakfast.